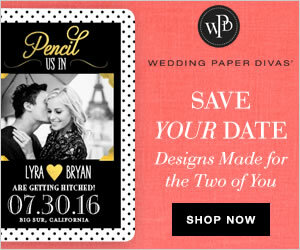 A Save The Date is so much more than an unofficial announcement of your wedding date. It is informal invitation of very special people to you very special day with its unique etiquette. In general in save the dates you only inform about the bride, groom, date and location of the wedding, but the real challenge lies in the details. Depending on your chosen venue and time of wedding, you can include much more info, especially if you expect guests from other states and plan a wedding during holidays. Save the date informs your guests (which are formally still not invited) when you plan to say "I do!" to help them not only reserve time to participate at your big day, but also think about possible gift. Beware! Although save the date cards can look very funny and playful, it's a big no-no to include info about your wedding registry. But you can include an address of your wedding site, where this info could be found. In recent years many couples used advantage of new print on demand technology and created thousands and thousands original save the date postcards or magnets with their own graphics (a photo of happy couple for instance) and wording. Being a starter of wedding stationary a save the date also act as an introduction to your chosen wedding theme and gives initial tune to your reception. Let's check some of the finest examples before we delve into details. Rustic Save the Date cards, for instance, attract newlyweds who want to set the classic, warm and comfortable tone of their wedding from the very beginning. There will be a lot of reddish and brownish tunes long with almost obligatory white in this theme with burlap, stone, wooden logs and similar signature decorative elements on your statioanry and wedding decor. Photo Save the Dates are among most popular ones because they can combine stylish design with a picture of real couple what not only instantly brings the feel of closeness and familiarity, but also presents the happy couple to the gusts who often met only bride- or groom-to-be. Photo Save the Dates above are fully customizable, what means you can upload your own photo (from engagement party for instance) and wording on already preset design, so you can make truly unique card without worrying if something doesn't work all right in printing process. What can be more optimistic than beach themed Save the Date invitations? The mere image of calm sea, crystal water, pearly sand, romantic sunset and the feel of gentle breeze through palms is great for every romantic couple. It fits well for today extremely popular destination weddings which are often closely connected with honeymooning in exotic places too. If you want to highlight your once in a life time event as spectacular gathering, a showy celebration or maybe slightly nostalgic recall of the eighties? With these glitter save the date cards your guests will probably expect bright colors, extravagant hairdos and disco music on the dancing floor months before the reception. There is no way to overlook such announcement! Save the Date magnets are probably the most modern form of save the date invitations. Being totally customizable, easy to personalize and inexpensive with wide choice of potentials to present the bride and groom in unique light, they are real indication of current trends in wedding industry. You can mail them to your guest who will simply stick them on their fridges or memory boards to keep the chosen date in mind.